Three Dublin shopping complexes anchored by SuperValu and another in Waterford are to be offered for sale from today at an overall guide price of more than €80 million which will give new owners a return of 6.44%. Dessie Kilkenny of selling agent Savills is to offer the four investments in the SV4 Collection for sale in individual lots if a buyer does not emerge for the entire portfolio. The four supermarkets originally formed part of a loan portfolio known as Project Aspen sold by Nama in 2013 for less than the €200 million asking price on behalf of investors David Courtney, Gerry O’Reilly and Terence Sweeney. Since acquiring the collection at a discount of about 75%, Starwood Capital, along with two other investment groups Key Capital Real Estate and Catalyst Capital, have successfully negotiated an extension of the rental arrangements with the Musgrave Group, owners of SuperValu. 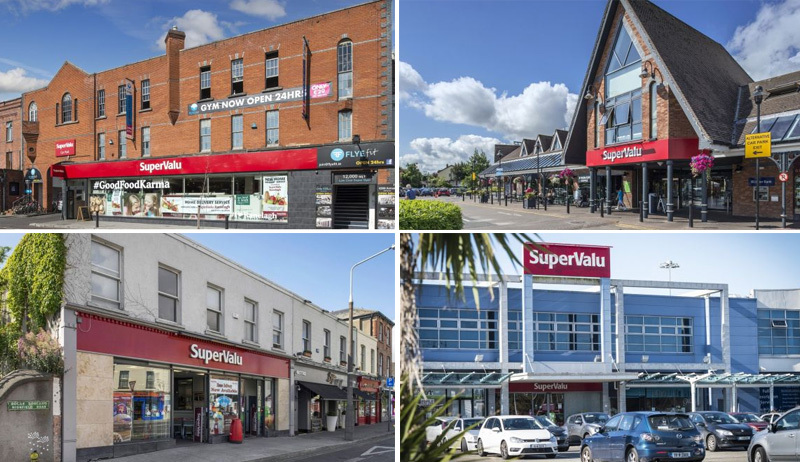 The four SuperValu properties are currently producing an overall rent of €5.38m, with 68% of the rent guaranteed by the Musgrave Group. The weighted average lease on the four centres has another 13.2 years to run. The portfolio has an overall floor area of 22,950 sq.m (247,031 sq. ft) including 37 commercial properties in all and 12 residential apartment. Savills estimate that the overall vacancy rate is no more than 0.65%. SuperValu has the largest spread of supermarkets in the country with no fewer than 222 stores handling 25% of the grocery market. The company has five new outlets planned for this year. The largest individual asset going for sale is Lucan Shopping Centre in west Dublin, where the guide price of more than €40m would show an initial yield of 6.45%. The next most valuable investment is Kilbarry Shopping Centre in Kilbarry, Co Waterford, where the asking price of €16m would produce a return of 7.18%. Then there are the two very busy SuperValu stores, at 31-33 Ranelagh Road, Ranelagh, and 13 Highfield Road, Rathgar. Each of them has been valued at €12m, with the Ranelagh investment set to show a yield of 5.89% and the Rathgar property in line to produce as return of 5.97%. The Lucan neighbourhood centre dates from 1991 and has an floor area of 12,008 sq.m (129,252 sq.ft). Trading alongside SuperValu is Dunnes Stores, which holds a long leasehold on its premises at a nominal rent. SuperValu underpin 59% of the rent roll which stands at €2,695,934. There is weighted average lease period to run of 11.8 years. Other notable occupiers of the Lucan centre include McDonald’s and Starbucks. SuperValu Ranelagh is another busy shopping facility in the centre of Ranelagh village, adjacent to the Luas station. The entire building extends to 2,363 sq.m (25,433 sq.ft) with ground floor retail accommodation extending to 928 sq.m (9,987 sq.ft). The upper floor is rented by FLYEfit gym which has four other gyms in the city. The centre is producing a rent roll of €738,255 and the leases have a weighted average time scale of 13.75 years. In Rathgar, the SuperValu centre has an even bigger mix at the busy crossroads of Rathgar Road, Terenure Road, Orwell Road and Highfield Road. The 2,396 sq.m (25,791 sq.ft) complex has retail on the ground floor with a mixture of offices and 12 apartments on the upper floors. There are also 20 basement car-parking spaces and four more at surface level. The complex includes a vacant site to the rear and a standalone two-storey building rented by Runzone and Accounts Assist. The Rathgar facility is producing rents of €748,080 and leases have more than 18 years to run. Kilbarry Shopping Centre, developed in 2000, extends to 6,183 sq.m (66,555 sq.ft) on a site of 5.45 acres with 430 parking spaces. The accommodation is laid out over two floors with 4,603 sq.m (49,550 sq.ft) of retail space on the ground floor and 1,580 sq.m (17,005 sq.ft) of office and ancillary accommodation overhead. SuperValu accounts for more than 83% of the total rent roll of €1,199,277 and is guiding €16m. The weighted leases have 13.7 years to run. Dessie Kilkenny says the supermarket and retail collection was one of the best to have come for sale in this market cycle.